Names: Lewis’ Mock Orange is also known as Wild, Western, Pacific, Idaho or California Mock Orange. Presumably due to its growth habit, it is sometimes also called Syringa, the name for the unrelated lilac genus. 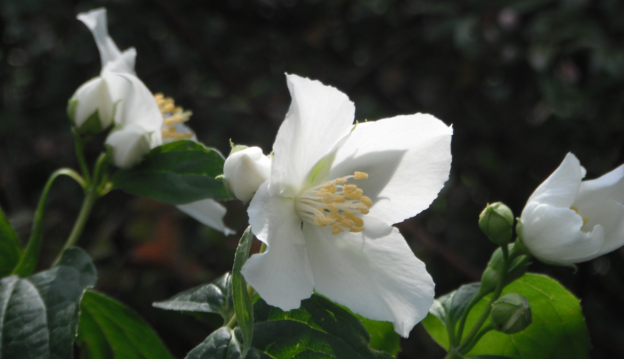 Philadelphus means “brotherly love;” named after Pharoah Ptolemy II Philadelphus. The common name, Mock Orange comes from the similarity of the flowers, in fragrance and appearance, to citrus flowers. Lewis’ Mock Orange was discovered by Meriwether Lewis in 1806. 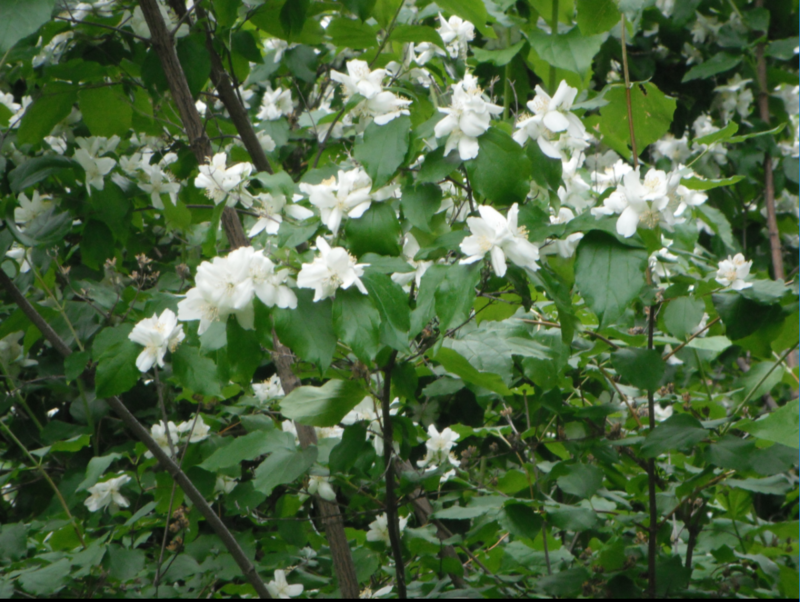 Relationships: There are about 60 species of Philadelphus native to North America, Central America, Asia, and southeastern Europe; about 27 Philadelphus species are native to North America. 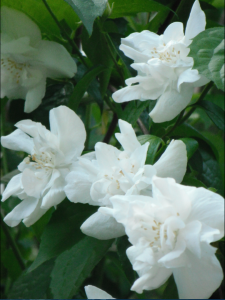 Distribution: Lewis’ Mock Orange is the state shrub of Idaho. It is native from southern British Columbia to the Sierras of central California, to Idaho and Montana in the east. 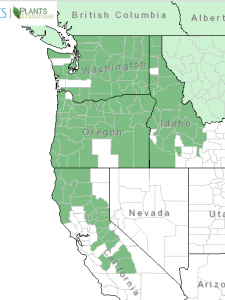 It is the only common Philadelphus species in the northwest; but it is extremely variable in vegetative and floral characters; a tall form west of the Cascades that has more hairy leaves is sometimes identified as var. gordonianus. Plants of the dry interior lowlands often have smaller more oval-shaped leaves. There are a few cultivated varieties; “Goose Creek” is a double-flowered form. Growth: Lewis’ Mock Orange grows 4.5 to 9 feet (1.5-3 m) tall. It grows in a variety of habitats from streamsides and moist open woodlands and forest edges, to dry, rocky hillsides, pine forests and sagebrush deserts. Diagnostic Characters: Stems grow erect, in a vase-like shape. Leaves are opposite, short-stalked, oval narrowing to a point, with 3 major veins from the leaf base to the tip. Younger leaves are often toothed on vigorous new shoots. 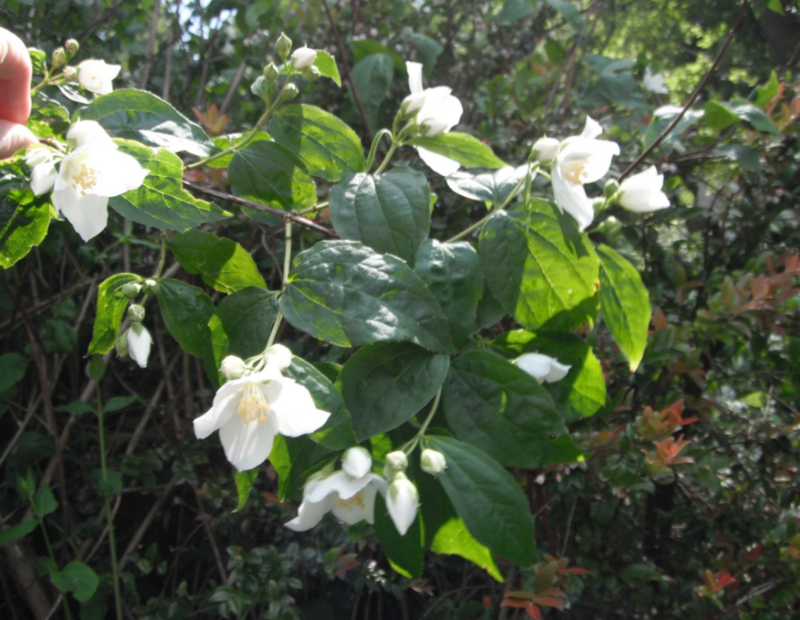 Flowers are white and fragrant, usually with 4 petals, in clusters of 3-15. Fruits are woody, 4-chambered capsules. The bark is reddish-brown, turning gray and flaking off as it ages. Propagation: Stratification of the seeds in coarse sand at 41º F (5º C) for 8 weeks increases germination rates. Lewis’ Mock Orange is easy to propagate from cuttings of half-ripe wood in July/or August or hardwood cuttings taken in December. Layering is also possible. Use by People: The wood was used by natives for making combs, arrow & harpoon shafts, netting shuttles, cradle hoops, snowshoes, digging sticks and more recently knitting needles and tobacco pipes. The flowers and leaves are rich in saponins; they were used almost like a bar of soap; mixed with water they can be rubbed into a frothy lather and used to wash hands, body and hair. 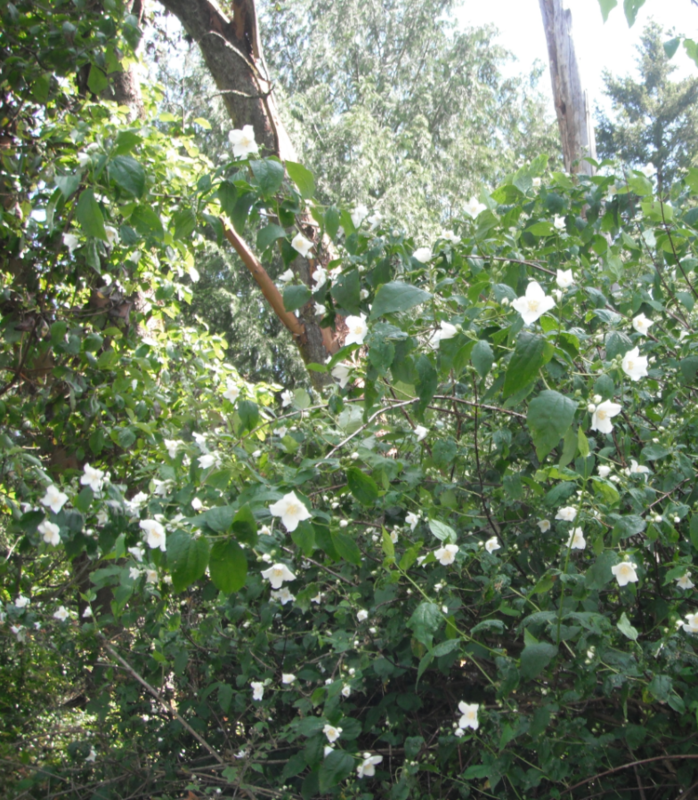 Use by Wildlife: Lewis’ Mock Orange is sometimes browsed by deer and elk. The seeds are eaten by quail and squirrels. The flowers are pollinated by insects, especially bees. 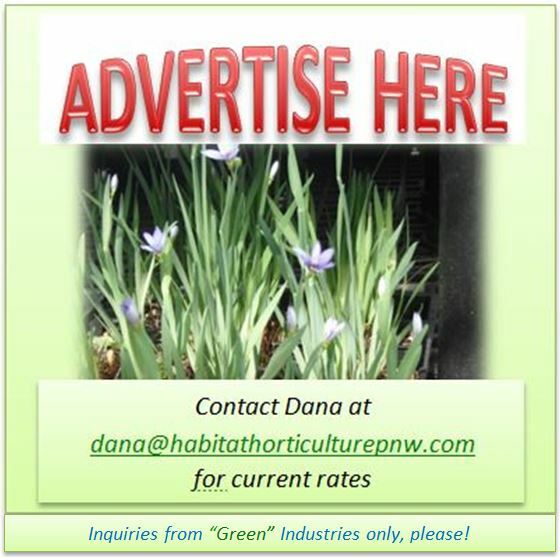 This entry was posted in Deciduous Shrubs & Vines on October 24, 2016 by habitatdana.